More than a dozen union leaders are staging a 24-hour occupation of the Kitsilano Coast Guard Station in Vancouver to protest against the planned closure of the station by the federal government. 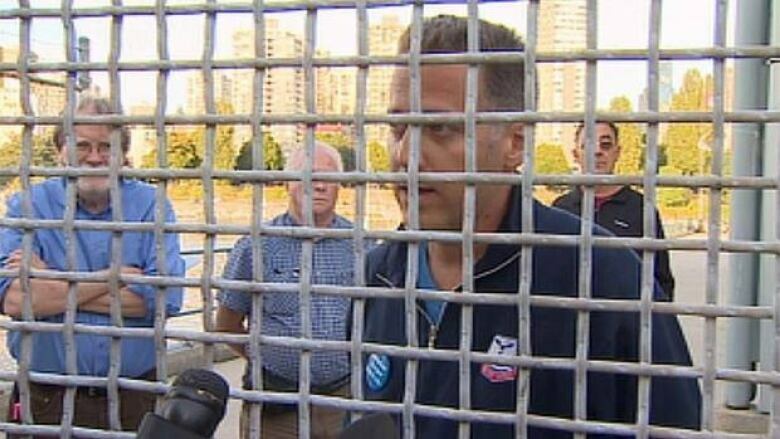 More than a dozen union leaders are staging an occupation of the Kitsilano Coast Guard Station in Vancouver to protest the station's planned closure by the federal government. Dave Clark, a vice-president with the Union of Canadian Transportation Employees, was among the group who entered the station on English Bay about 5 p.m. Friday. Clark says they are trying to make a statement to the federal government by staying at the station for 24 hours. "We've tried the reasonable, we've tried to give them explanations as to why they're wrong. It's obvious they're not listening so maybe this might have them listen," Clark said from behind the station's locked gate. Clark said the federal government is ignoring a report that claims closing the station will endanger lives. Clark said he and the other protestors, including B.C. Federation of Labour President Jim Sinclair, will leave the station at 5 p.m. Saturday. He said the protestors would be keeping well out of the way of Coast Guard personnel staffing the base. The station is scheduled for closure next spring, despite an outcry from boating groups and the provincial and municipal governments.